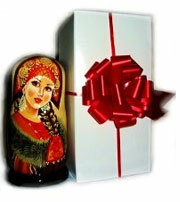 Deliver your beautiful Russian gift in great style! We will carefully package all items and gift wrap these into gift boxes lined with tissue paper and finished with red ribbons and bows. You can select Gift Wrapping as an option when you add items to the cart, or you can add gift wrapping for any item upon checking out. Remember, you can ship any item directly to an alternate address -- just chose a different delivery address when you check out. If you choose an alternate delivery address, we will automatically print and send a gift receipt with the package -- gift receipts include personal messages and do not indicate the price of the items. ADD Gift wrapping in the Shopping Cart. 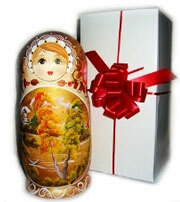 Click "View Cart" to see your cart and add gift wrapping for your individual gift items. 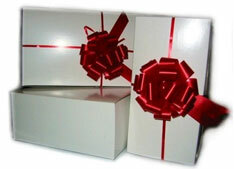 Gift wrapping is available for nearly all products, except very large paintings. 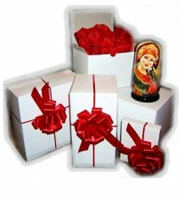 The flat fee of only $4.95 is added to your invoice when you choose gift wrapping. The photos below show some of the most popular gift wrapping ideas that customers use most frequently. We hope that you will find shopping here with us easy and fun. If you do have any questions regarding gift wrapping or anything else, please do not hesitate to contact us!